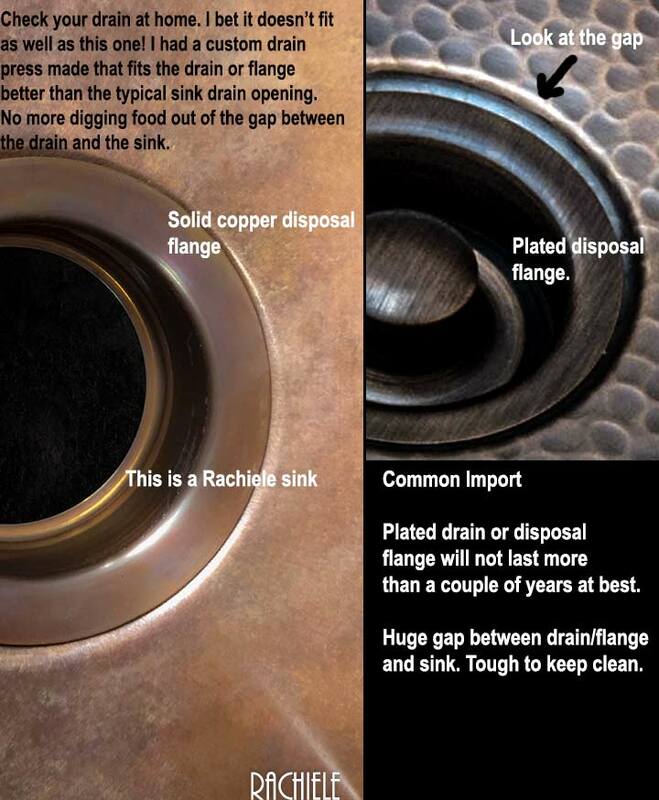 Solid Copper Drains and Disposal Flange assemblies for Rachiele sinks I hope you will consider joining our family of custom sink owners. I look forward to working with you. Please do not consider anything other than a solid copper drain or disposal flange assembly. You will find the plating will eventually come off. There is no plating on solid copper, so there is no worry down the road. 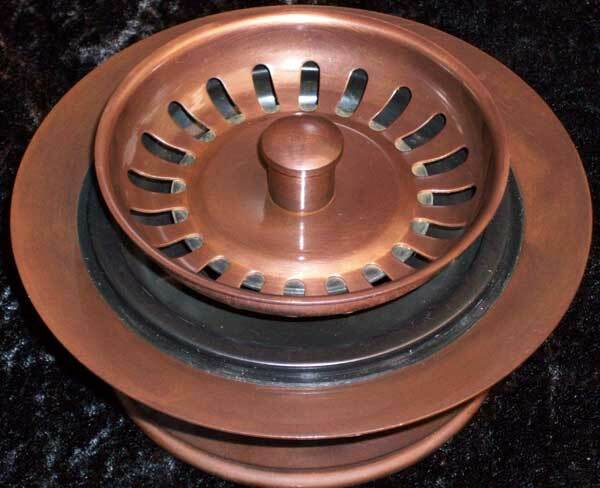 Finally... A real solid copper kitchen sink drain and disposal flange that is not "plated" in copper. Many of the drains and disposal flange assemblies you will see on the market are plated. The plating will come off in time. Invest in solid copper. June 2016: We are now manufacturing in our new factory in Apopka, FL. I redesigned the area where the drain/flange interfaces with the sink. The new design is a better fit than you will find in most sinks. Click on the link to the left. Fits Insinkerator type units with 3 3/8" ID as well as most KenmoreÂ® , KitchenAid, Maytag , Jenn Aire, and select models of Whirlpool . Will not fit Franke Waste King, or Whirlaway models. (Insinkerator makes about 80% of all disposals on the market.) Lifetime warranty on copper parts, 1 year mechanical. If you have a Waste King disposal, you will need two parts in order to make it work. You will need the Waste King 3101 ISE adapter kit and an ISE 5298 Flange body. Both should be available for less than $15 total, plus shipping. The Evolution Insinkerator has a Quiet Collar Sink Baffle that will make our strainer basket sit a bit high. It will function properly, however the strainer will be above the floor of the sink slightly. I recommend the InsinkErator Badger 5XP 3/4 HP disposal. I found a great deal on Amazon for you. Basically they say it is used due to damage on the box. It has a full warranty as if new and you save about $30. Our drains and disposal assemblies are tested and designed to fit perfectly. We have sold thousands of these over the past 9 years. Our solid copper disposal system is designed with a strainer instead of a simple plug. This will give you the option of plugging the drain or gently running water while shucking oysters or other items while letting water flow through while catching debris. The water will not evacuate nearly as fast as removing the strainer assemtly. Simply lift and turn the strainer and it will stay in the up position so water will flow. Turn until it drops to plug the drain. Solid copper kitchen drain and strainer/stopper. This is used without a disposer. This drain is made of solid copper and is not plated, therefore will last a lifetime. Most other drains on the market are made using a base metal of either brass or stainless. In as soon as a few months to as much as 2 years or so, you will begin wearing through the plating and will expose the base metal.Warranty:1 year mechanical. The "copper cup", the permanent part in your sink, is guaranteed for life! 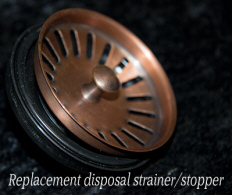 Replacement parts: Our past supplier had a minor issue with the strainer baskets for the drains and the disposal flange strainer/stopper that came with the disposal flange. We are replacing them with a new design that should be significantly better. If you have purchased an old style and it has failed within a year of purchase, and you wall within that year, we will replace with the new style at no charge. Simply pay $12 for shipping. If it has been longer than one year, we are greatly discounting the replacement parts below our cost. You can order them below. When we replace the DRAIN strainer basket, the silver screw with a hole in it (in the part that resides in your sink) will have to be replaced as the pin on the strainer has a slightly larger diameter. We send that part as well - along with detailed instructions. 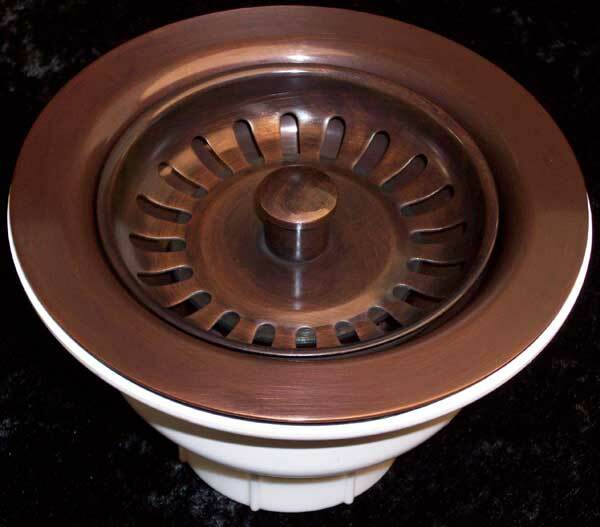 If you order the drain replacement kit, you may receive a replacement copper cup that is installed in the sink. You do not have to use it. You may use it if you like. If you use it, you will have to re apply plumbers putty to install it in your sink. Rachiele is everything you need to create an awesome kitchen or bath! Shop Now!